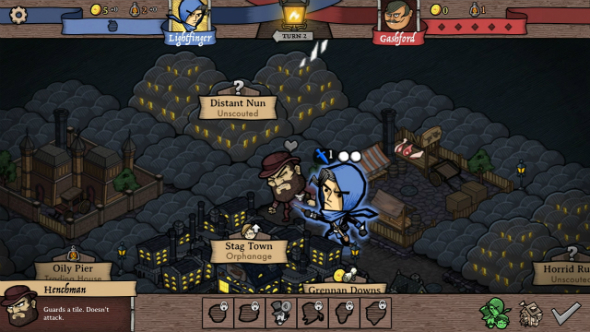 Antihero, a fast turn-based strategy game about robbing a Victorian-era city, is coming out on July 10th. We have an exclusive launch trailer for you to watch above so get your eyes all over it. If sneaking around dark alleys is your thing make sure to check out list of the best stealth games on PC. Antihero is more Artful Dodger than Dishonored. It’ll have you running a thieves guild during the Industrial Revolution, recruting street urchins and hiring thugs to be part of your gang, and then sending them off to pick pockets and burgle houses. But here’s the catch: you’re not the only ones climbing the guttering of rich estates, as there are other, competing guilds to out-steal. As such, you don’t want to hoard all your gold, instead you’ll want to invest it in growing your guild with more thieves and upgrading your toolset. If that doesn’t outdo your opponents then, screw it, you can just outright assassinate their members. You’ll be up against the AI in the story-driven campaign but can also invite friends for offline and online matches. What’s a little bribery, blackmail, and assassination between friends? What’s cool about the multiplayer is that you can play live against each other or play asynchronously, taking your turn whenever you get the time. 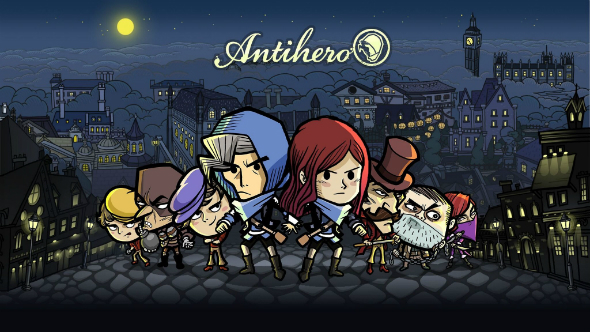 Antihero is now up on Steam if you want to find out more – you can also check out its website. You’re best off watching that trailer above, though, as it gives a good overview of the game, and you can see it in action. Neat art style, huh?